The new law suspends work on the controversial section of the highway through the TIPNIS national park and indigenous territory, pending the outcome of a consulta previa (prior consultation) with affected indigenous communities to be conducted according to their customs, the Bolivian constitution, and international agreements. The law calls for a study of alternative routes that protect both indigenous rights and the environment, as well as a development plan for the TIPNIS communities. It also prohibits future colonist settlements in the indigenous territory. Community support for TIPNIS marchers. Credit: La Razón. But the TIPNIS protesters aren’t satisfied. They want the MAS (Movement Towards Socialism) government to annul its contract with Brazilian construction company OAS, terminate its loan agreement with Brazil, and permanently cancel the TIPNIS road. A consulta previa after the fact of these contracts is illegitimate, they argue, especially with construction on the adjoining road sections (outside the TIPNIS) already underway. The protesters note that the indigenous people, through their autonomous government, have been on record as formally rejecting the road through their territory since 2010. Further, they argue that “suspension” of work on the TIPNIS road segment is a meaningless gesture, since the government has assured that work can’t proceed without the required environmental license (among other things), and that no work has actually begun. The claim that “not a stone has been lifted” to construct the TIPNIS road is in fact central to the government’s argument supporting the validity of the consulta previa. Still, the evolution of the government’s position on the consulta previa-- one of the key points of dispute in the TIPNIS conflict--shows just how much the protesters’ persistent pressure has shifted the terms of the debate. Under the Bolivian constitution and international accords to which Bolivia subscribes, the government is obligated to seek the “free, prior, and informed consent” of indigenous communities impacted by proposed development projects. After being slow to implement any type of consultation process, the government—under pressure from Brazil--scheduled an initial community meeting just before the start of the August 15 march, making it virtually impossible for the marchers to attend. TIPNIS marchers en route to La Paz. 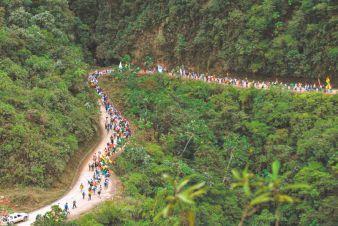 Credit: La Razón.In September, after numerous failed attempts to dialogue with the marchers along the route, the government announced plans to formalize the consulta through a process of serial meetings with individual groups--starting with communities in support of the road. The consulta would not be limited to indigenous communities but would also include colonist settler groups affected by the TIPNIS road. Its sole purpose would be to solicit input on environmental mitigation measures, not to consider alternative routes or opposition to the TIPNIS road in general. The feasibility of any proposed alternative, according to the government, would have to be documented by the proponents themselves. Following the September 25 police repression, and the announced “suspension” of work on the TIPNIS road segment, the government raised eyebrows by stating its apparently new legal conclusion that the Bolivian constitution’s consulta previa requirement does not apply to road construction, but only to the exploitation of natural resources in indigenous communities. Morales proposed a referendum (up-or-down plebiscite on the route) or consulta to be conducted with one of four possible constituencies: indigenous communities in the TIPNIS; all communities along the TIPNIS road; all communities along the larger road (3 segments); or residents of the Beni and Cochabamba departments. Given the greater support for the road within larger geographies, this reinterpretation appeared to many as a political subterfuge. As Bolivia’s Fundación Tierra notes, while Bolivia’s constitution does include a particular reference to extractive projects, it also mandates consultation with indigenous groups generally before any legislative or administrative measures that affect them—such as a construction contract or loan agreement to finance a road through their territory—can be adopted. The government cannot simply substitute a referendum with a preferred political constituency for its obligation to consult before the fact with affected indigenous groups. While the government still maintains that the consulta previa is not constitutionally required, its recognition of a legally mandated consultation process that is restricted to indigenous groups within the TIPNIS, follows indigenous customs, accepts the responsibility to examine alternative routes, and may even be binding (unclear as of this writing), is a significant advance. Ironically, this is not so different from what the TIPNIS protesters were originally demanding. That the protesters have refused to accept these concessions is a measure of the distrust that has developed over the past two months--due not only to the brutal police attack on the march, but also to the government’s failure to protect the protesters’ rights and its consistent efforts to discredit and impugn their credibility. As the TIPNIS marchers (now 2000 strong) begin their arduous climb up from the tropical lowlands to La Paz, there are signs that the government’s rhetoric may be softening. This week, newly installed Viceminister of the Interior Roberto Quiroz deplored the government’s past “violation of human rights by omission,” guaranteed the marchers’ safe arrival in La Paz, and extended an open invitation to dialogue. Chief of Staff Carlos Romero affirmed that the TIPNIS march is part of the “process of change”—a departure from the usual accusation that it's linked to a right-wing conspiracy. Along the route, the marchers have received a warm welcome and support from surrounding communities, in sharp contrast to their hostile reception two weeks ago in Yucumo. 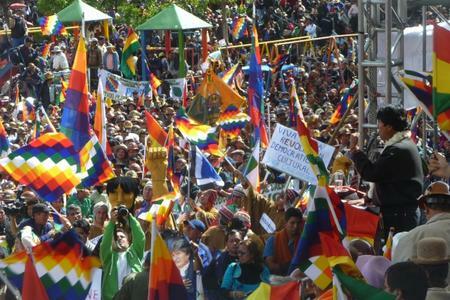 The marchers have also cooperated with the government by agreeing to delay their arrival in La Paz until after Sunday’s controversial judicial elections, in order to avoid any appearance of interference. This first-ever vote for national judges, mandated by Bolivia’s new constitution, has become something of a referendum on the MAS government. To protest what they regard as a biased candidate selection process by the MAS-controlled Congress, Pro-government rally, La Paz. Credit: Dario Kenner. opposition parties have encouraged voters to void their ballots-–by marking them with an “X,” “NO,” or “TIPNIS.” While the TIPNIS groups deny any association with this campaign, Morales in recent weeks has accused the marchers of seeking to disrupt the elections. Despite these outward signs of conciliation, constituencies remain entrenched on both sides of the issue. 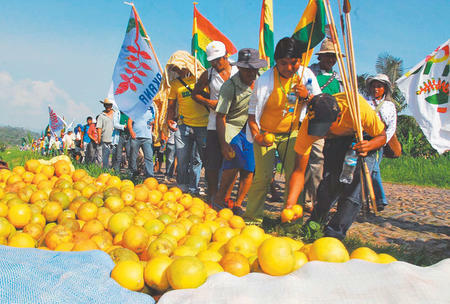 This past Wednesday, tens of thousands of MAS loyalists—including coca growers, cooperative miners, peasants, colonists, and government employees--rallied in La Paz, and in other departmental capitals, to demonstrate their support for Morales. The pro-government demonstrators defended the “process of change,” encouraged voters to participate in Sunday’s historic elections, and voiced their strong support for the TIPNIS highway. Complaints of obligatory attendance notwithstanding, the turnout was impressive. For their part, the TIPNIS marchers have vowed to remain in La Paz until the government passes a law to permanently ban the road through the indigenous territory. “They’ll have to build the road over our dead bodies,” warns Fernando Vargas, president of the TIPNIS subcentral. The march is expected to arrive in La Paz early next week. In an open letter to Minister David Choquehuanca, who reportedly persuaded Morales to suspend the TIPNIS road, Maria Galindo from the feminist activist group Mujeres Creando asks that he accompany the indigenous women leading the march into the city, as a gesture of solidarity and to prevent further violence. While the odds against this scenario materializing are pretty strong, it’s anyone’s guess as to what will happen next.